Denial premiered at the Toronto International Film Festival on 11 September 2016. It was theatrically released in the United States by Bleecker Street on 30 September 2016, and in the United Kingdom by Entertainment One on 27 January 2017. Deborah Lipstadt is an American professor of Holocaust studies whose speaking engagement is disrupted by David Irving, a Nazi Germany scholar. He files a libel lawsuit in the United Kingdom against Lipstadt and her publisher for declaring him a Holocaust denier in her books. Since, in the UK, the burden of proof in a libel case lies with the accused, Lipstadt and her legal team led by solicitor Anthony Julius and barrister Richard Rampton must prove that Irving had lied about the Holocaust. To prepare their defence, Lipstadt and Rampton tour the Auschwitz death camp in Poland with a local scholar, while the research team subpoenas Irving's extensive personal diaries. Lipstadt is annoyed by Rampton's apparently disrespectful questions on the subject, and frustrated when the team minimises her involvement in the case, arguing that she harms its chances of success. Members of the British Jewish community plead with her to settle out of court to avoid creating publicity for Irving. However, her team has a promising start when they persuade Irving, by appealing to his ego, to agree to a trial by judge instead of a jury, which he could have manipulated to his advantage. Irving conducts his own legal representation, facing Lipstadt's legal team. Irving endeavours to twist the presented evidence for the defence. Lipstadt is approached by a Holocaust survivor who pleads for the chance to testify, but Lipstadt's legal team insists on focusing the trial on Irving. Irving tries to discredit evidence for the existence of gas chambers at Auschwitz, claiming there were no holes on the roof for the Zyklon B gas crystals to be introduced. His soundbite "no holes, no holocaust" dominates the media coverage. Furious, Lipstadt demands that she and the Holocaust survivors take the stand. Julius angrily counters that Irving would only humiliate and exploit a survivor on cross-examination, as he has in the past. Rampton visits Lipstadt at her home to explain his approach and earns her trust. In court, he subjects Irving to skilful cross-examination and exposes his claims as absurd, while expert testimony exposes the distortions in Irving's writings. As the trial concludes, the judge, Charles Gray, worries the defence by suggesting that if Irving honestly believes his own claims, then he cannot be lying as Lipstadt asserted. Gray rules for the defence, convinced of the truth of Lipstadt's portrayal of Irving as deceitful. Lipstadt is hailed for her dignified demeanour, while her legal team reminds her that despite her silence during the trial, it was her writing that countered Irving's lies and provided the basis for the victory. At a press conference, Lipstadt praises her lawyers for their strategy. In April 2015, Hilary Swank and Tom Wilkinson were selected to star in the film, based on the book History on Trial: My Day in Court with a Holocaust Denier by Deborah Lipstadt, with Mick Jackson directing, and Gary Foster and Russ Krasnoff producing under their Krasnoff/Foster Entertainment banner with Shoebox Films. Participant Media and BBC Films co-financed. In November 2015, Rachel Weisz replaced Swank, and Timothy Spall joined the cast, with Bleecker Street distributing the film. In December 2015, Andrew Scott, Jack Lowden, Caren Pistorius, Alex Jennings, and Harriet Walter joined the cast. Howard Shore composed the film's score. Principal photography began in December 2015 and concluded by the end of January 2016. Denial was filmed in London and at the Auschwitz concentration camp, Poland. The film had its world premiere at the Toronto International Film Festival on 11 September 2016. The film was released in the United States in a limited release on 30 September 2016, and in the United Kingdom on 27 January 2017. Denial received positive reviews from critics. On review aggregator website Rotten Tomatoes, the film has an approval rating of 83%, based on 161 reviews, with an average grade of 6.8/10. 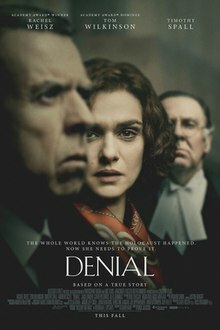 The website's critical consensus reads, "If Denial doesn't quite do its incredible story complete justice, it comes close enough to offer a satisfying, impactful drama – and another powerful performance from Rachel Weisz." On Metacritic, the film has a score of 63 out of 100, based on 34 critics, indicating "generally favorable reviews". ^ "Denial". Box Office Mojo. IMDb. Retrieved December 5, 2016. ^ "Denial". TheWrap. Archived from the original on December 3, 2016. Retrieved December 2, 2016. ^ "Denial (2016)". The Numbers. Nash Information Services. Retrieved July 24, 2018. ^ D'Alessandro, Anthony (June 1, 2016). "Rachel Weisz-Timothy Spall holocaust denier drama 'Denial' plots September release". Deadline Hollywood. Penske Business Media. Retrieved June 1, 2016. ^ McNary, Dave (April 27, 2015). "Hilary Swank, Tom Wilkinson Starring in Holocaust Denial Drama". Variety. Penske Business Media. Retrieved June 15, 2016. ^ Hipes, Patrick (April 27, 2015). "Film Briefs: Hilary Swank & Tom Wilkinson to topline Holocaust Drama 'Denial' –". Deadline Hollywood. Penske Business Media. Retrieved June 15, 2016. ^ Hipes, Patrick (November 5, 2015). "'Denial' Holocaust-Denier Drama Now Starring Rachel Weisz Acquired By Bleecker Street". Deadline Hollywood. Penske Business Media. Retrieved June 15, 2016. ^ Tartaglione, Nancy (December 9, 2015). "Andrew Scott Joins Rachel Weisz In Holocaust Legal Drama 'Denial". Deadline Hollywood. Penske Business Media. Retrieved June 15, 2016. ^ filmmusicreporter (June 15, 2016). "Howard Shore to Score Mick Jackson's 'Denial'". Film Music Reporter. Retrieved June 20, 2016. ^ Williams, Kimber; McRainey, Megan (February 11, 2016). "Filming for 'Denial' comes to Emory". Emory Report. Emory University. Retrieved January 26, 2018. ^ Lawrence, Rebecca (January 3, 2016). "Curl about town! Rachel Weisz's auburn wig gets a little windswept as she pounds the street on the set of Denial wearing a frumpy tartan coat and scarf". The Daily Mail. Associated Newspapers. Retrieved June 15, 2016. ^ Wloszczyna, Susan (September 30, 2016). "Denial". RogerEbert.com. Ebert Digital LLC. Retrieved December 27, 2016. ^ "Denial". Toronto International Film Festival. Retrieved July 26, 2016. ^ Evans, Greg (June 17, 2016). "'Denial' Trailer: Rachel Weisz & Timothy Spall Spar In Fact-Based Holocaust Denier Drama". Deadline Hollywood. Penske Business Media. Retrieved October 7, 2016. ^ "Denial". BBC Films. BBC. Retrieved January 26, 2018. ^ "Denial (2016)". Rotten Tomatoes. Fandango Media. Retrieved August 27, 2018. ^ "Denial reviews". Metacritic. CBS Interactive. Retrieved September 19, 2016. ^ Rahman, Abid (December 15, 2016). "Denzel Washington's 'Fences' Leads Nominations for AARP's Movies for Grownups Awards". The Hollywood Reporter. Prometheus Global Media. Retrieved December 26, 2016. ^ Ritman, Alex (January 9, 2017). "BAFTA Awards: 'La La Land' Leads Nominations". The Hollywood Reporter. Prometheus Global Media. Retrieved January 10, 2017.